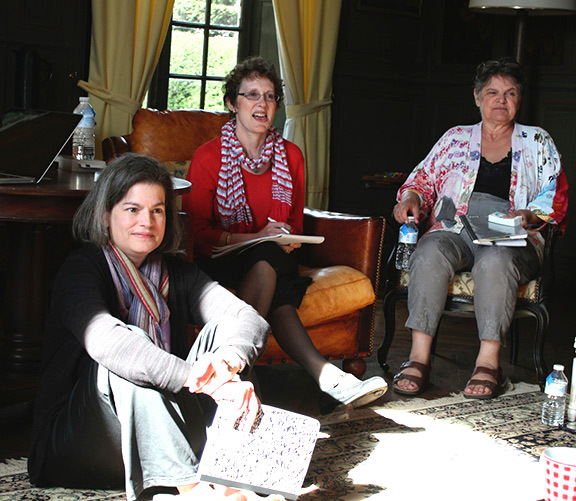 Julie Dodd: Your group has done some writers’ retreats, including at the farm home of one of your group members in North Carolina and at Château du Pin in France. 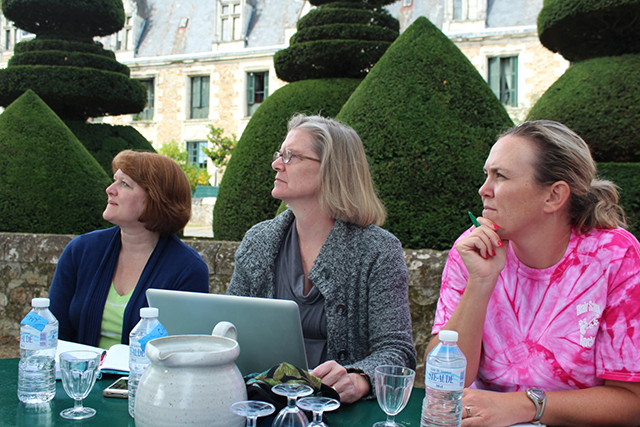 What has your group found to be the advantage of having a writers’ retreat in an away-from-home location? Kay Windsor: The most obvious answer is that the advantage of going away from home is that there are fewer distractions. 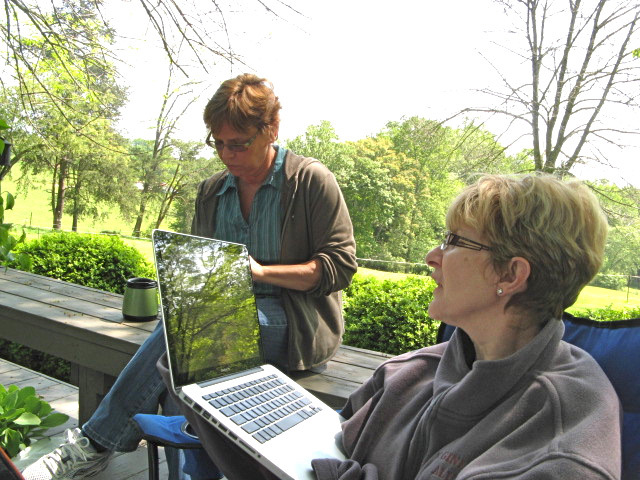 We really do retreat to write. We tried some half-day retreats in Winston-Salem where about half of us live, but it was so easy to try to multitask: I’ll just run home for lunch to check on someone or since I’m still in town, I’ll run over to my niece’s birthday party and be right back. It’s not that we were not committed to writing and to the group, but with 13 busy women of ages ranging from 30s to 70s, you can imagine the family and work needs. The mothers with young children, teenagers or elderly parents may need to be away from home to focus on writing–and usually we have cell phone coverage to keep in touch. 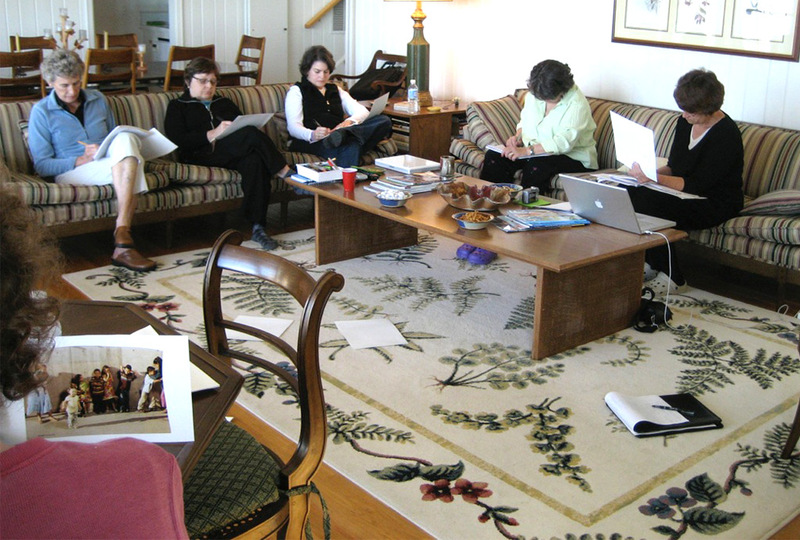 Julie Dodd: Your group has a process in its group writing, with Carol Henderson, who teaches Writing Toward Healing workshops, serving a group leader. How does the process typically work? Kay Windsor: When we read aloud what we have written in response to a prompt, we do not allow disclaimers or explanations; we just read what’s on the page, knowing that it is in first draft form (and that may be the only draft we write of it). We are asked not to offer critical or editorial comments or comment on how that’s like something that happened to us. Now we might add those comments ourselves, but we had clear guidelines from the beginning that this was not a therapy group (although the writing might prove therapeutic) and we were not to feel we had to comfort someone who read something difficult. We often wrote reflections about something difficult that someone else had just read instead of talking about it first. Julie Dodd: From looking at photos of your group at retreats, I see that some members are writing on laptops and some in notebooks. Kay Windsor: Members use notebooks and pens, iPads and laptops to write during the retreats. Some of us switch back and forth between the devices. When we began to gather writings for the Farther Along book, it was much easier to use laptops and share the writings immediately, but some of us like to doodle as we write and like the feel of pen on paper too. Julie Dodd: From your experience both with your blog writing group and in your classroom teaching, what is a good way to structure the group writing time? Kay Windsor: Sometimes a piece of literature the class was studying or a particularly good piece of journalistic writing would evoke an appropriate prompt: Use Tennyson’s line from Ulysses, “I am part of all I have met,” to share an experience from your 13-year-old self, for example. Often I used reflective writing prompts at the end of a study to have students think about what the work had meant to them. When emotions ran strong about an event, reflective writing helped everyone to think more and react more mindfully. Sometimes for a particular class, I would offer a daily prompt and have students write for 5 minutes before we began the day’s lesson. And we do share how to start a group and all the prompts from the first five years in the Farther Along book. Julie Dodd: What else do you think I should know about group writing in general or about group writing on a very difficult topic? Kay Windsor: The power of reflective writing can be health-restoring, sanity-restoring and just good practice for all us. Socrates credited Plato with the idea that the unexamined life is not worth living. In a sense, the examination that happens through writing, reflecting on that writing and sometimes sharing it is restorative and certainly for the women in my writing group, it has been a lifeline.